Today was the NoGA QRP Group's 2nd Annual Peanut Power Sprint. The event took place from 4:00 to 6:00 PM EDT, or 2000 to 2200 UTC. It was another beautiful day in Central NJ with sunny skies and a temperature of about 85F (29C) at Sprint time. I set up in the backyard, as I did for QRP Afield, using the PAR END FEDZ 40-20-10, supported by my 31' Jackite pole. I bungeed the Jackite to my kid's old wooden swingset (which I serioulsy have to thing about taking apart and discarding now that they're both teenagers). I ended up working 47 stations - 1 on 15 Meters, 6 on 40 Meters and the balance on 20 Meters. There was a lot of activity, which was a good thing. I thought 40 Meters would have been more productive than it turned out to be; but there was a ton of RTTY activity as this weekend was the CQ WW RTTY contest. 40 Meters was wall to wall with RTTY almost as far down as 7.035 MHz. Something happened though (two things actually) that made me want to facepalm. The first instance occurred when I was running a frequency on 20 Meters. 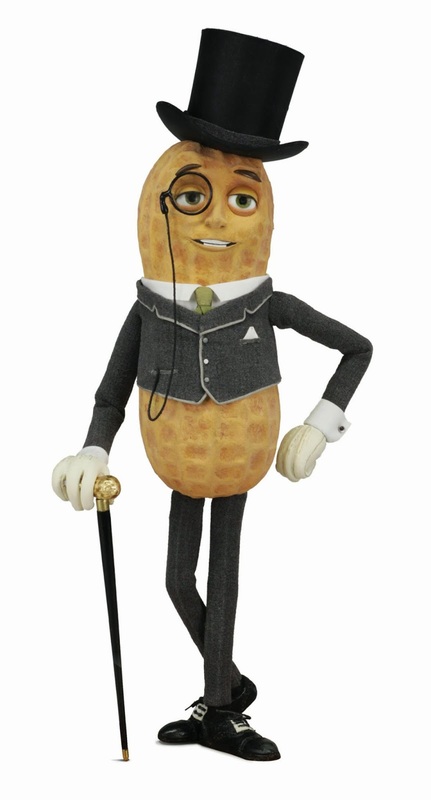 I was calling "CQ NUT" and was working stations at a good clip, in excess of a rate of 60 an hour (2 stations per minute is phenomenal for me). Then, a very loud station called me and after we completed the exchange, HE started calling CQ on the frequency! The frequency that I had been running! I know no one "owns" any particular frequency, but I thought it to be very bad form. I would never work a station calling CQ and then start calling CQ myself on that same frequency after working him! What was he thinking? The other incident was my old pet peeve. Once again, I was holding a frequency (after having moved from the first incident) and was working a rather weak station, when someone started calling CQ on our frequency with out even bothering to "QRL?". I can't stand it when stations just hop on a frequency and start using it blindly without checking to make sure if it's already in use. Another instance of bad manners. 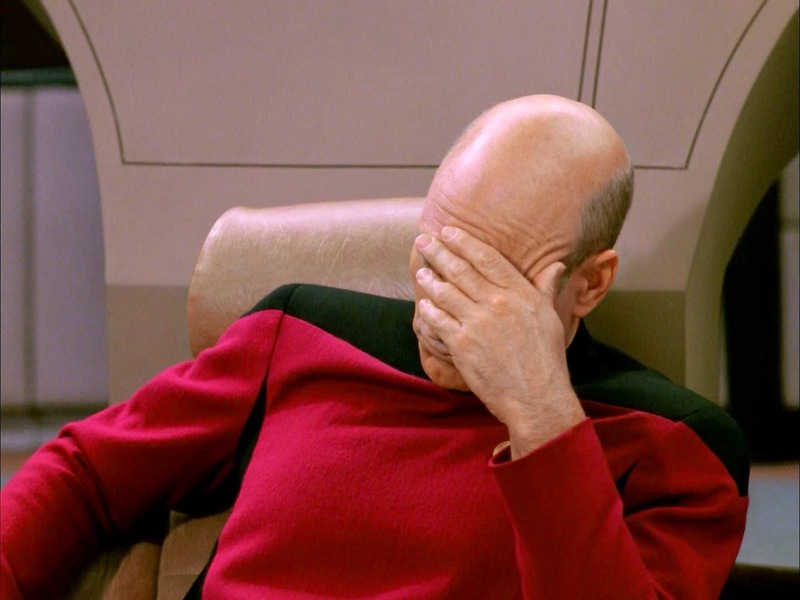 Then, to make matters worse, I tried working the station in question, and I got a response of "DUPE WRKED B4". Not in my log, we didn't! But that did prove to me that he was able to hear me, and if he was able to hear me, then he also heard me while I was trying to work that weak station - when he jumped in without QRLing. Thanks to Elecraft, though, for designing the KX3's superb filtering. I was able to notch out the offender and completed the QSO with the weak station who was using an output power of 900 milliWatts. Those two incidents notwithstanding, I had a blast! Many thanks to the NoGA QRP Group and the organizers of the Peanut Power Sprint for a very enjoyable afternoon. The Four State QRP Group has done it again. They have just recently introduced another kit, only to see the initial run of kits get gobbled up within 36 hours of announcing them as ready for sale! This new kit is a regenerative receiver, designed by Dave Cripes NM0S, who was just inducted into the QRP Hall of Fame this past FDIM. 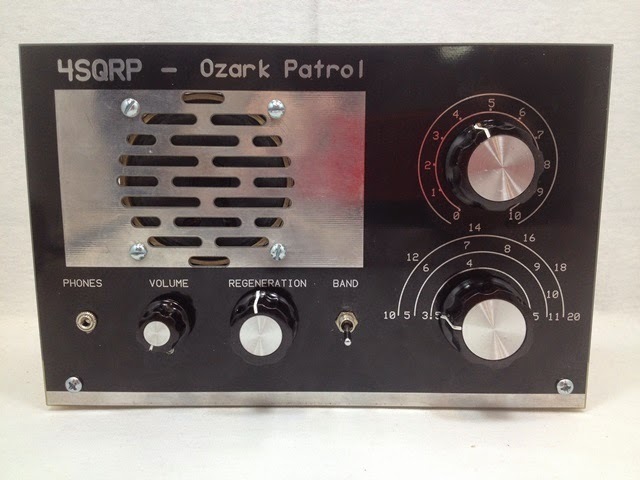 The new kit is called the Ozark Patrol and is reminiscent of the Globe Patrol that many of us built in our very much younger days. The kit will become available again in 2-3 weeks as per the Four State QRP Group Website. You can go to the Ozark Patrol page by clicking here. 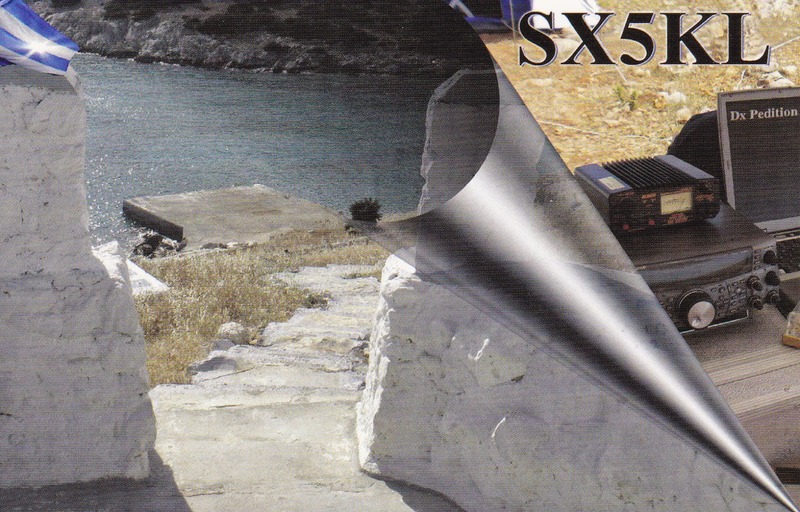 The receiver covers 3.5 to 15 MHz in two bands. It's powered by 6 "AA" batteries and the radio comes with a speaker and a provision for plugging in a pair of "cans". Even though they're sold out, I placed an order for one. I have built several kits offered by the Four State Group and I have never been disappointed so far. I don't expect to be with this kit, either. In fact, I am hoping to relive some memories and get transported back to a simpler time. I think this little kit will do that, just fine. 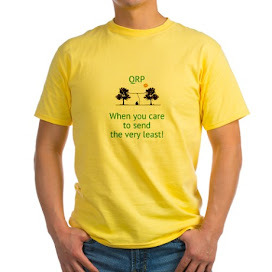 QRP - When you care to send the very least! then I will take it! I had two very nice DX QSOs during lunch today. These were not "UR 599 TU 73" QSOs, nor were they exactly ragchews. But they were a nice change of pace from the typical "wham, bam, thank you Ma'am" kind of micro-QSOs that seem to be so prevalent these days. 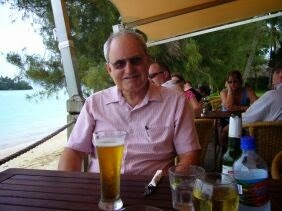 The first was with Vic SM7ZDI who answered my CQ on 18.086 MHz. Vic was using a Yaesu FT-1000D at 100 Watts to a Windom. He had a good 569 signal and gave me the same. Vic told me that it was about 8C (46F) in Sweden. I was very grateful for the 65F (18C) that we had today, when I had heard that. My next QSO was on 20 Meters and this time I was the one answering the CQ - that of Bob, G3PJT. Bob hails from Cambridge and was using his brand new KX3! I was his second QSO and he sounded great. His antenna was a 3 element Yagi up about 17 Meters. Bob was telling me that he also has a K3, so he's quite familiar with the Elecraft line. It was cool being his second QSO and providing him with a 2X KX3 QRP QSO, to boot. It was fun having a "normal", unhurried QSOs with two new Ham friends from outside the US. If only they were ALL like this! I almost pulled another good one yesterday. I was down in the basement, adding the entries into my log from QRP Afield from Saturday. It had just turned 4:00 PM and I had the radio on and was monitoring 20 Meters at the QRP Watering Hole of 14.060 MHz. Why was it so quiet? Was the band dead, or did we have another CME or solar flare? After all, it WAS time for the NoGA Peanut Power Sprint to start. wasn't it? Then I realized ...... that's NEXT Sunday! I'm just glad I caught myself, and didn't turn on the KX3's memory keyer, sending "CQ PP". I would have died from embarrassment. That would have almost been as bad as hearing someone send "UP", and the realize that they were sending to you! Getting back to QRP Afield on Saturday, I ended up participating for only two hours, from 2:00 to 4:00 PM. I had planned to operate for four of the six hours - from Noon to 4:00 PM, but chores got in the way and ended up taking more time than I had originally thought they would. The two hours was fun, though. I set up the PAR END FEDZ in the back yard using my 31' Jackite pole as a support. I was able to make about 25 contacts on both 20 and 40 Meters, and by far 20 Meters was the money band. I made all of three contacts on 40 Meters. Now with Summer coming to an official end today and the chillier weather knocking on the door, you have to grab these comfortable outdoor QRP opportunities whenever you can. The Peanut Power sprint is a good "end of season closer" for those of us who hate to send too much time out in the cold. And fortunately, the long range forecast for next Sunday is sunny and in the upper 70s or just above 80F. Looks like a good time! You've undoubtedly heard of Summits on the Air (SOTA), Islands on the Air (IOTA), Lighthouses on the Air and maybe you've even heard of Parks on the Air (POTA). Ed Breneiser WA3WSJ announced a new program on QRP-L this morning - Fire Towers. 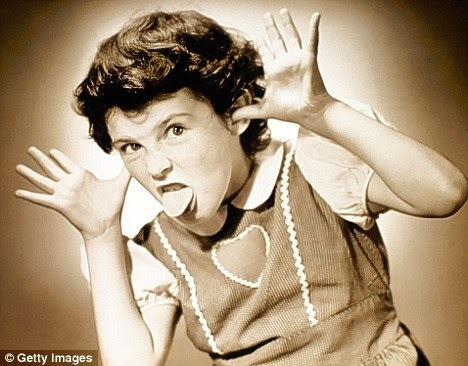 You may be having the same initial reaction that I did ...... Huh ?!? But you know what? If it promotes QRP operating in the Great outdoors, then it's a good thing and deserves support. So without further ado .... here's Ed's announcement from QRP-L. I'm pleased to announce that the Boschveldt QRP Club will sponsor an Amateur Radio Fire Tower Program. The program is global in scope. The fire tower program will have awards for activators and chasers similar to SOTA, but much less restrictive in the rules etc. So get out there and activate a few fire towers this fall and winter as all fire tower contacts in 2014 will count. Please take a look at the website as I have posted an Excel file that lists all PA Fire Towers in the program. More states and countries will be added later. 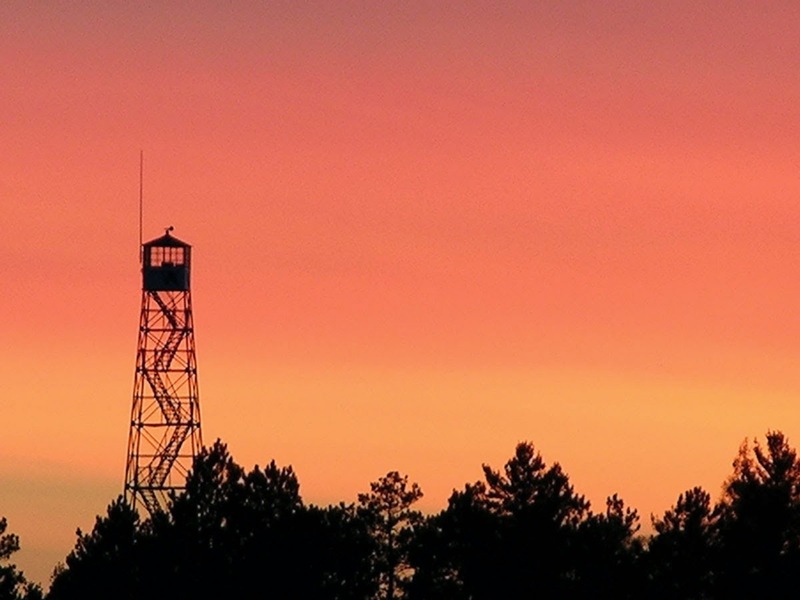 If you make one contact at a fire tower, it will count as an activation - no repeaters. An awards program is in the works for this program such as Fire Tower WAS , Fire Tower WAC, Worked ALL PA Fire Towers etc. Activators will get special awards in the various categories. The objective of this program is to get more QRP operators out into the wilderness and see all of Mother Nature's beauty! There's no requirement to hike to the tower, just get there anyway you can and operate. For all the chasers, grab a few fire tower QSOs and an award or two. OK .... so it IS a little bit different, but it does sound like fun! I immediately got to wondering if there are any fire towers in New Jersey. I figured there must be, as we have a lot of forested areas. I was surprised to find out that there are twenty one ! 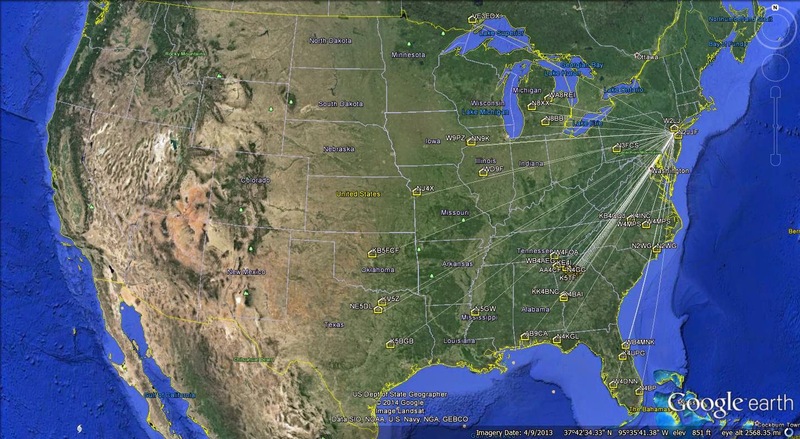 I'll bet dollars to donuts that you could do the same thing to find out where these structures exist around you. No big mystery as to why I was able to work Pertti OH2PM in Finland during lunch today, is there? I think with this set up, Pertti would have been able to hear me had I been rubbing two sticks together. 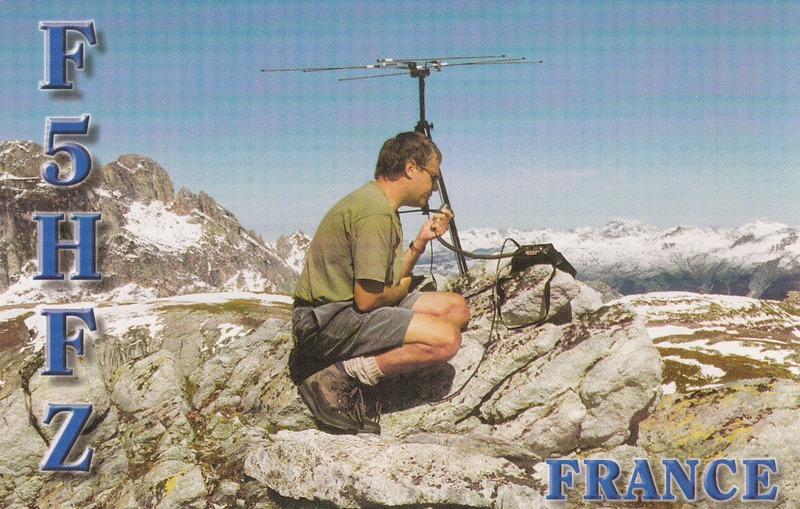 Thanks for the QSO, Pertti ! This was posted to QRP-L by good friend and QRP Hall-of-Famer, Jim W4QO. It was in response to another post by another good friend Pat KZ5J. Pat is an avid DX'er, QRP Fox Hunter and an all around fantabulous op, who mentioned that he has, for the most part, given up on working DX with QRP. This was Jim's response basically saying, "Hey Pat, don't give up so easily". It's a gem and it's worth re-posting here (for those of you who don't subscribe to QRP-L). 1. Most of the logging programs (which by the way rejuvenated by hamming) allows you to keep track of things like power, band, etc. I think it's cool to be able to punch a button and see what the bands look like. 2. QRP ARCI does certificates for members for FREE so I use them for most of my paper chasing. 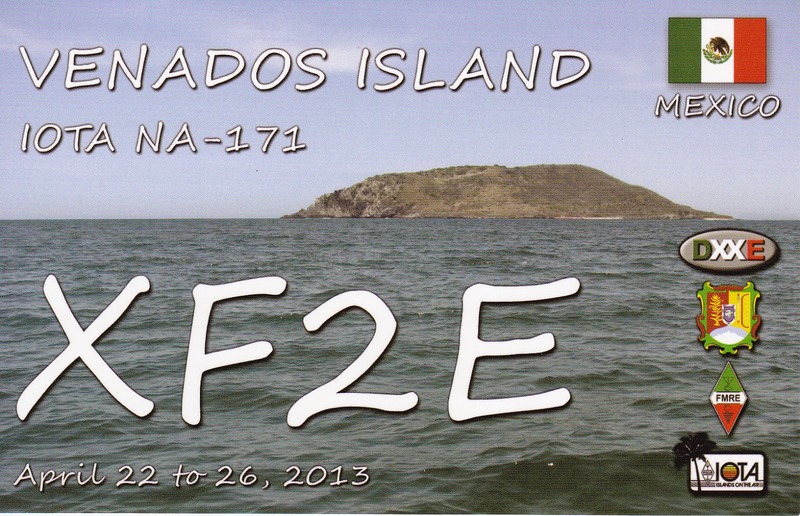 They also do not require QSLs/LoTW. It's all honor system which when you get down to it makes sense for QRP contacts since having a card doesn't prove you were QRP. It's up to you to be honest. After all, non-QRPers all think we are lying anyway! So what. I know what I did with 5 watts CW and 10 watts SSB, the international definition of QRP. Your definition may vary; results too! 3. Wire antennas work fine for DXing. I went for about a dozen years with a horizontal loop at 35, then 50, then 75' and have DXCC on several bands with that before I put up a YAGI which does work better but not a whole lot better. I enjoy using it for contesting. Worked 102 unique countries last fall in the CQ WW DX contest. My next challenge is to do DXCC with a #32 wire. I'm eyeing the tree right now to put up a 125' enamel long wire. 4. Like Ron, we all have success stories about "busting pileups", "first call", etc. Really makes you smile! It's a big thrill when you use QRP, a rig you built yourself, and attic antenna. 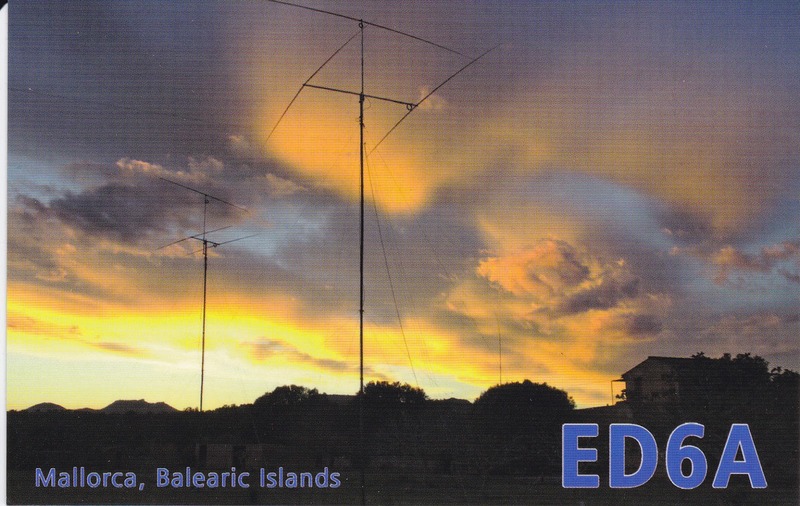 My friend W4JDS has 75 countries with his attic dipoles QRP. Now he's moved into a house with trees! 5. I use every piece of technology I can find (other than remote receivers - I do use those - WEBSDR - to hear myself but not to work DX) such as spotting networks, as VE7CC and DX Summit, Reverse Beacon Networks. RBN now looks for the word TEST when you test. So send TEST a couple times DE callsign a couple times and see where you are going with your signal. I did snagged #258 QRP last Friday when the bands were wide open when I worked Western Sahara. Had them with 600 watts 30 years ago but this was sweeter. Propagation does 95% of the work. 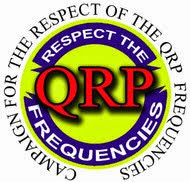 Again, to each his own but I do like that QRP DX stuff and about any other QRP stuff such as SOTA and contests such as the Peanut Power Sprint - http://www.nogaqrp.org, building kits. Frankly as Terry WA0ITP says, "I just love this QRP stuff!!!" These are all good things for the budding (and maybe not so budding) QRP DXer to keep in reserve in the ol' brain box. Pirate - or for real? I worked SP4KVA on 20 Meters at lunchtime. As you can see, he/she was being heard all over the place. Great signal, but ........ SP4KVA doesn't show up on QRZ, QRZCQ, or on Google except for showing up on various telnet reports. Avast ye swabs! 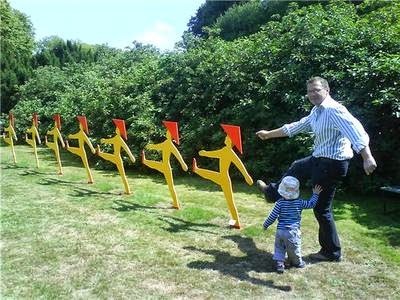 Raise the tri-bander and point 'er to the sou'west ....... Arrrrgh! Cut the lines and raise the jibs and the dipoles, ye scurvy dogs! In the day to day, sometimes it's easy to forget the little things that make life worthwhile. 1) Like that yesterday was my daughter Cara's 13th birthday - she's officially a teenager now! Did I mention she DETESTS having her picture taken and that she was ready to kill me when I snapped this one at Lake George this Summer? 2) Like that today they served chicken corn chowder in the cafeteria at work today - one of my all time favorite soups. 3) That while I was eating my chicken corn chowder in my Jeep, I managed to work DL4ISX in Germany (with some difficulty due to QSB) and HF37SONDA in Poland (who was super loud). Yeah, it's the little things in life that are the absolute best! for yardwork, but it was a good day for radio! Cool, rainy and damp weather kept me inside for most of the day, grocery shopping notwithstanding. This is the first Saturday in a while that I actually got some time to sit down at the radio and get some operating in. The 17, 15 and 12 Meter bands seemed to be in decent shape and I worked a bunch of European stations today. And W1AW/5 in Texas was so strong that he sounded like he was just down the street. I think I could have worked him with 100 milliWatts, if I had tried. And this was all icing on the cake as the day started out well with a successful VE session first thing this morning. Only two out of three pre-registered candidates showed up, but both of those passed their exams and earned their Technician licenses (one of the two getting a perfect score!). This evening I twiddled the dial on 40 Meters and just spent some time listening to various fists. Remember that post I wrote a few weeks ago about atrocious bug fists? 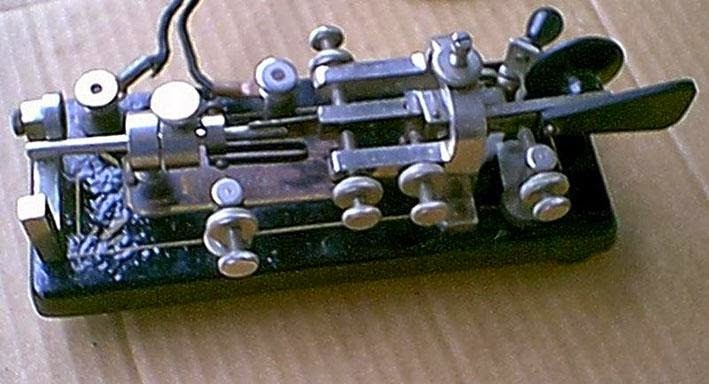 Tonight I heard a guy who was using a Vibroplex Blue Racer that he claimed was manufactured in 1919 (I think that's what he said). I was astounded as I though he was using a keyer and paddles. His fist was THAT good! He was probably clipping in at around 25 WPM or so, but he was a breeze to copy. I really did think he was using a keyer. His fist was a joy to listen to - the code literally flowed and it was like listening to a symphony. The Ham he was in conversation with was using Bencher paddles and the built in keyer that was in his rig, and he did not sound as good as the guy on the bug! I wish I sounded that good! 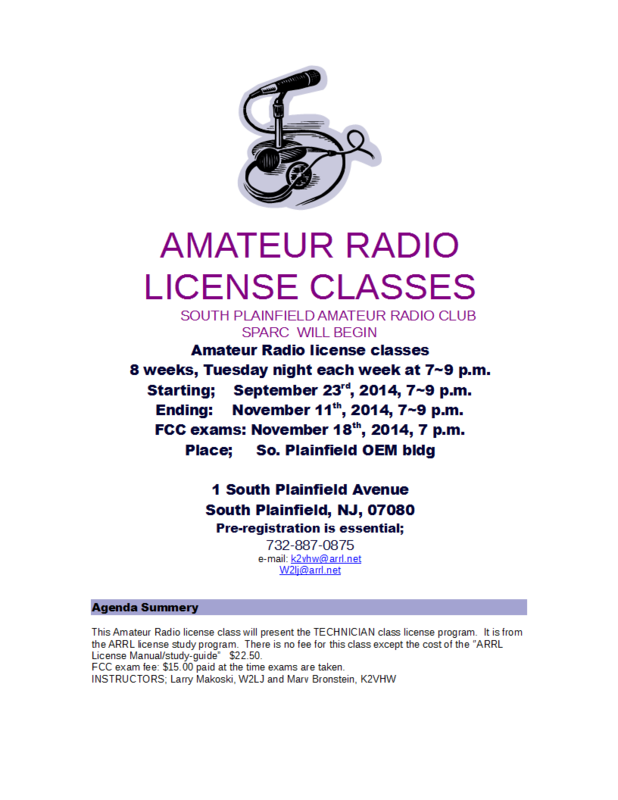 Marv K2VHW and I, under the auspices of the South Plainfield Amateur Radio Club, will be teaching a course for those in the greater Central New Jersey area who want to earn a Technician class license. I'm excited, because so far we have eight potential students who have pre-registered. We have room for more, so if you're interested or know someone in the Central NJ area who might be interested, contact either Marv or myself. We would also ask that anyone who has pre-registered or wants to register, to please try to attend the next SPARC meeting on Wednesday, September 17th at 7:00 PM at the South Plainfield OEM building. At that time, we will be taking count and placing a group order for license manuals for the class. Marv and I are both ARRL Registered Instructors, and a such we can apply for a group rate for the manuals. 72 de Larry W2LJ QRP - When you care to send the very least! In celebration of the 20th anniversary of QRP Afield, this year’s event will follow the rules, times, and scoring of the original event from 1994. Note that this is now a six hour event, encouraging everyone to get out during daylight hours. Note also that the scoring particularly encourages QRPp operation, with added points for operating a field location at powers below one watt. Information regarding the event is given below. It has been taken from the June 1994 issue of NEQRP’s 72 monthly magazine, modified only slightly to accommodate reporting via email. It will also soon be posted to the NEQRP web page. The weather today is absolutely gorgeous in the northeast, with temperatures in the low to mid-70s, mild breezes, and a deep blue sky. This should actually improve over the next couple weeks (we hope), with the advent of early fall. Should be a great time to get out with your QRP rigs, portable antennas, etc., and to take a short (or long) hike to your favorite mountain, state park, lake, wherever and to join in the fun. See you on the 20th! QRP Afield-2014 is sponsored by the NEW ENGLAND QRP Club and is designed to encourage QRP enthusiasts to field-test their radio equipment, using temporary and non-commercial Antennas and non-commercial sources. Field Location: Any location using battery/solar/natural power AND temporary antennas Low power QRP: Less than one watt output. 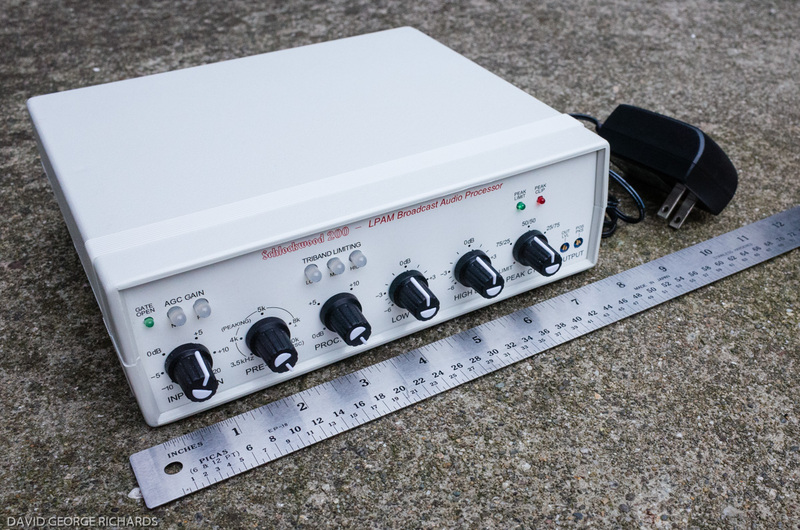 High power QRP: 1 to 5 watts output. 1 point for each contact from a permanent location using high power QRP. 2 points for each contact from a permanent location using low power QRP. 4 points for each contact from a temporary location using high power QRP. 8 points for each contact form a temporary location using low power QRP. Note: All contest contacts MUST be made using the same location and power output. Multipliers Each state/province/country worked counts for one point. Multipliers may be counted only once, regardless of band worked. Of course! The ONE Saturday where I actually have time to get on the air ..... the weather refuses to cooperate! We've had some bad thunderstorms blow through this afternoon and we have a severe thunderstorm watch until 9:00 PM local time. As you can see by the radar map, the band of cells we went through is now to our east (my QTH denoted by the little red marker). But those cells off to the west should be here in an hour or 90 minutes. The antennas will remain unplugged for the evening, it looks like. Maybe tomorrow. This is supposed to clear out tonight and not much is planned for Sunday. Maybe I'll be able to spend some quality time behind the key tomorrow. Oh well, a good opportunity to print out Skeeter certificates. This was designed to be printed on 4X6 Glossy stock and then laminated. You can jam in your portable ops bag, in case you're always forgetting the US QRP frequencies like I do. Feel free to save the JPG as an image on your own computer and print it out, if you like. I also have it as a doc file if you'd like to edit to suit your needs. An e-mail request will get it sent to you. How did I miss this? I've had my September QST for over a week now (we Lifemembers seem to be the last to receive our QSTs! ), and I must confess .... today was the first time I've given it a leaf through. I was surprised and gladdened to read a really nice op-ed piece by good friend Jim W1PID on page 101. Jim shared his thoughts on the changing face of Amateur Radio in celebration of the ARRL's 100th anniversary, but yet focused on the things that remain the same through the changes. The joy, the excitement, the satisfaction, the fun. Good article, Jim and I'm glad the Newington Bunch had the good sense to publish it! I'll admit, I fell for it! Back in 2000, I applied for and received W2LJ as a vanity call. I had upgraded to Amateur Extra back in 1994, and I had been wanting a shorter call sign. I picked W2LJ as L & J are my first two initials. The fee was all of $10 back then, if I remember correctly. It seemed like a bargain - a buck a year. The FCC has adjusted very slightly downward - to $21.40 - its proposed Amateur Service vanity call sign regulatory fee for Fiscal Year 2014. In a June Notice of Proposed Rule Making (NPRM), the Commission said it was planning to hike the current $16.10 vanity fee to $21.60 for the 10-year license term. The FCC released a Report and Order and Further Notice of Proposed Rulemaking (R&O) in the proceeding on August 29, in which it recalculated the fee to $21.40 for the 10-year license term. The $5.30 increase still represents the largest vanity fee hike in many years. The new $21.40 fee does not go into effect until 30 days after the R&O is published in The Federal Register. In the R&O, the FCC said it considered eliminating the regulatory fee for Amateur Radio vanity call sign applications but decided not to do so "at this time," because it lacks "adequate support to determine whether the cost of recovery and burden on small entities outweighs the collected revenue; or whether eliminating the fee would adversely affect the licensing process." The Commission said it would reevaluate this issue in the future to determine if it should eliminate other fee categories. The FCC's Wireless Telecommunications Bureau sets the vanity call sign regulatory fee using projections of new applications and renewals, taking into consideration existing Commission licensee databases, such as the Universal Licensing System (ULS) database. The FCC reported there were 11,500 "payment units" in FY 2014. The Commission said the vanity program generated an estimated $230,230 in FY 2013 revenue, and it estimated that it would collect nearly $246,100 in FY 2014. The vanity call sign regulatory fee is payable when applying for a new vanity call sign or when renewing a vanity call sign, although some older vanity call signs are not subject to the regulatory fee. I wonder what the fee will be in 2020 when it's time for me to renew again! I think it was around $14 in 2010 when I last renewed. Oh well, if you want to dance, you have to pay the piper, I guess. I love this part, though. 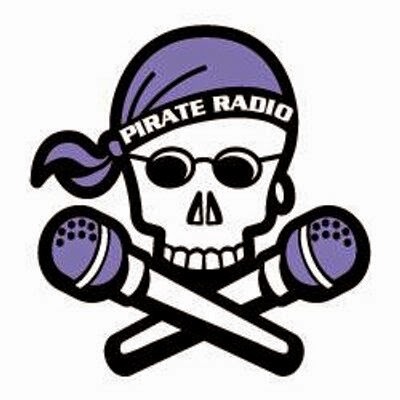 "In the R&O, the FCC said it considered eliminating the regulatory fee for Amateur Radio vanity call sign applications, but decided not to do so "at this time," because it lacks "adequate support to determine whether the cost of recovery and burden on small entities outweighs the collected revenue; or whether eliminating the fee would adversely affect the licensing process." Translation - "Naaah! 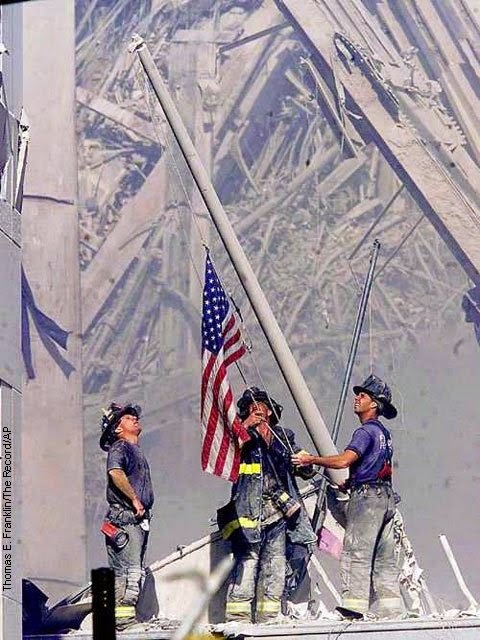 We decided to raise it by $5.30 instead." 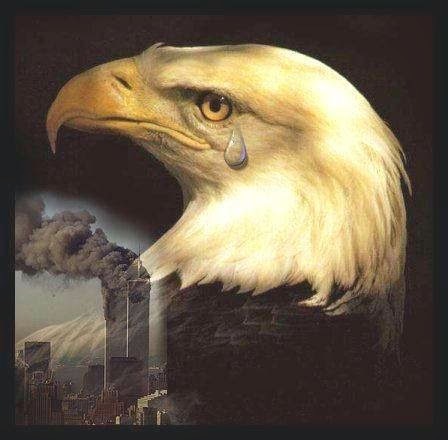 Ya just gotta love the Federal Government! 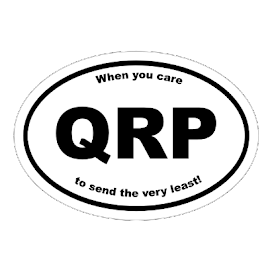 Show the world some QRP pride ! $1.00 (new batch is slightly smaller - really QRP!) via snail mail to my QRZ address or by Paypal to w2lj@arrl.net and one of these puppies can be yours! 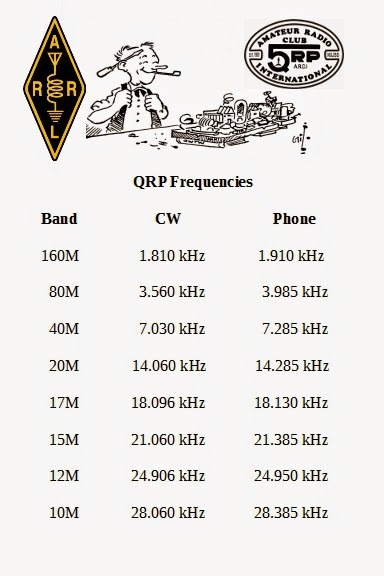 QRP - Do More With Less! 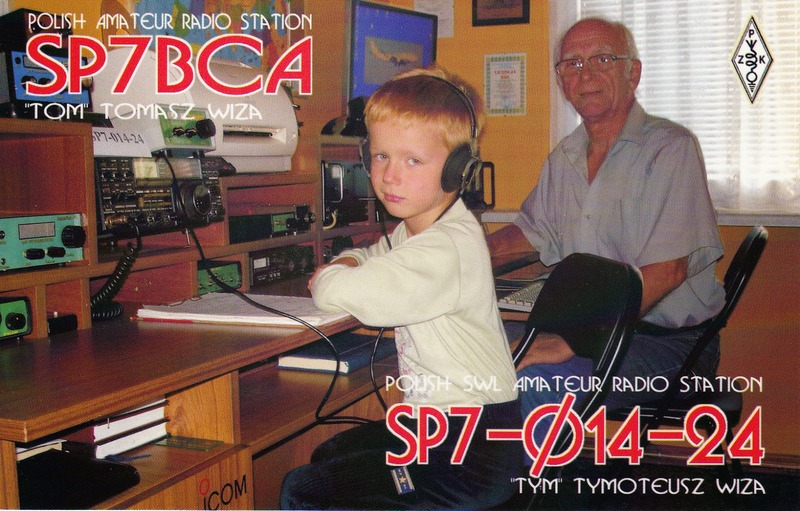 The World's Best Hobby - a book about Amateur Radio. Modifying the FT-897 to get the best from it. N0HYD - QRP & Portable Adventures! Portable Ops 23/45: 20 Meters Was Fun Today! From Alaska to the Lower 48, my Ham Radio Adventure Continues.